C sos, Shee shos, by the Cee Cstore? Close! C_So! is a stranger-than-usual SG-1000 game that involves a young child punishing bullies by death of seesaw. Your job is to lure the bullies onto the seesaw, then jump on the opposite end to either fling them upwards or stomp them with your small child stompin’ shoes. Slay all the bullies and collect every item in the level to progress to the next one, while also avoiding killer balloons that float rampantly around. The balloons have no purpose beyond extra points, and while you can’t kill them via seesaw, often they will inexplicably fly across the screen and burst against the wall of the level. I’ve tried to figure out the balloons’ unreasonable actions, and their reason for being – perhaps because the game stars children and balloons could be considered scary to some kids… I guess? They don’t seem to have much purpose other than to loiter and annoy, but hey, extra bonus points for popping them all; bonus points were cool once. The sprites look so moldable, like putty. I am usually among the first to embrace weirdy games like C_So!. Getting revenge on bullies via playground equipment? Quick, shove the controller in my hand! But despite C_So!‘s novel premise, the game itself never plays quite right. First and foremost, the levels are not assembled well at all. 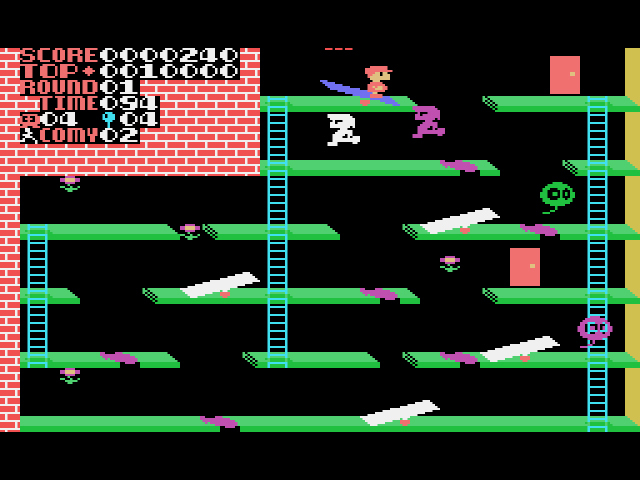 There’s trampolines and long jumps and long falls and warping doors and mile-high ladders and items in odd locations, and clusters of seesaws in a chunk of the level, and no seesaws in other parts of the level. Indeed the levels look as though the game designers vomited a bunch of random in-game elements onto a black screen. Perhaps unsurprisingly, C_So! has a level editor. Place your seesaws in the middle of nothing! Color your bullies purple! (not sure why the bullies have a variety of different colors. I think their color might relate to their movement patterns, but I’m not sure). While I’m usually right crap with level editors, I could make better levels than the ones found in the game themselves. Perhaps that’s the point of these crappily designed levels, to make players feel smarter than they are with the level editor? I wouldn’t put it past a game as strange as this. I got to the third level of C_So! multiple times before I see-ed my last saw. I’m sure I could have gotten past it eventually, but frankly, the game felt like work. Bullies rarely go where you want them to go, and you’re on a time limit so you have to follow them around and hope they make their way to a seesaw. Then you have to make sure they walk onto the seesaw at the correct angle, which means you wait for them to walk to the edge of the seesaw before jumping backwards and flinging them upwards. Launching bullies is totally doable, and I got better at it with time, but I never really enjoyed myself. And games, above all else, are about enjoying yourself. Sorry C_So!, I don’t think you and I will ever C eye to eye. 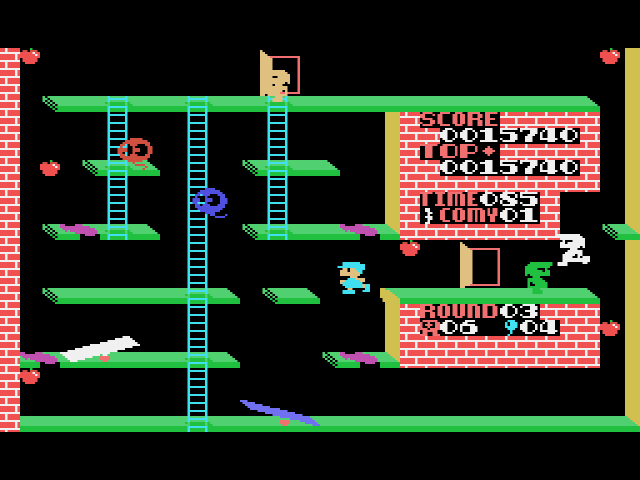 Given the improvement we have seen in some of your recent reviews of SG-1000 games, I am looking at the screenshots and thinking this looks like a step back for the console. Every time I see this cover it disturbs me somehow. It seems kind of savage. Then I realized it kind of reminds me of the curb stomp from American History X.